Step 1: Pick up 2 Earbuds from the charging box. Step 2: Hold down the Multifunction Button for 3 Seconds that Earbuds R and L will connect to each other automatically. One of the earbud LED light will turn off, and the other one will be alternating from Red to Blue. Step 3: Turn on your Bluetooth Device, you will find "GS-TWS R" on the bluetooth list, then press it to pair with your device. Step 4: That's done! 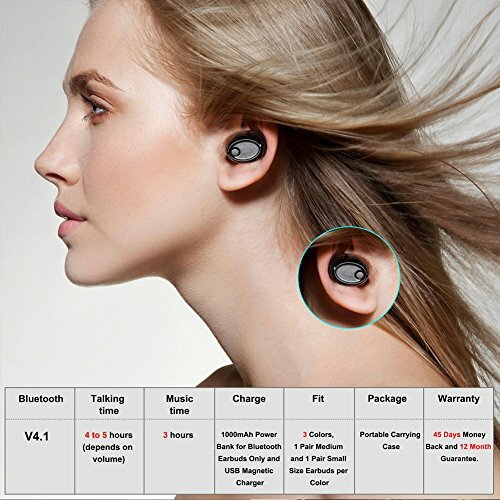 Just place the earbubs into your ears to enjoy your music. If you meet any problems about the connections, do not hesitate to send us an email for solutions. 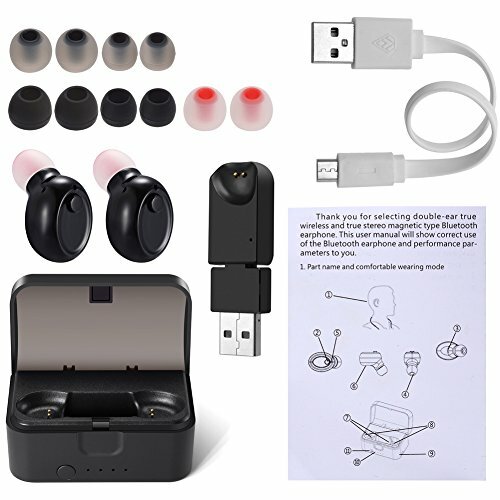 Charging of Earbuds - Two choices (Charging Box or USB Magnetic Charger) for charging. 1.When the charging box is fully charged with a micro USB cable, it can provide 6-7 times quick full charge for twins earbuds without USB cable. 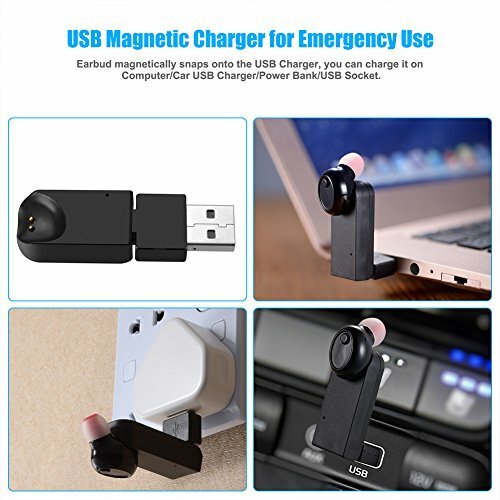 2.Or you can charge the earbuds with the USB Magnetic Charger which can be used on computer/ car USB charger/ power bank. Red Light is normally on during the charging process. Blue Light is normally on when the charging completed. 【Package Contents】- Package comes with Pair of Earbuds, a 1000mAh Charging Box, a USB Charge Cable and a User Guide. Besides, bonus with a USB Magnetic Charger (for your emergency use) and two sizes of replacement Eartips (total 6 pairs). 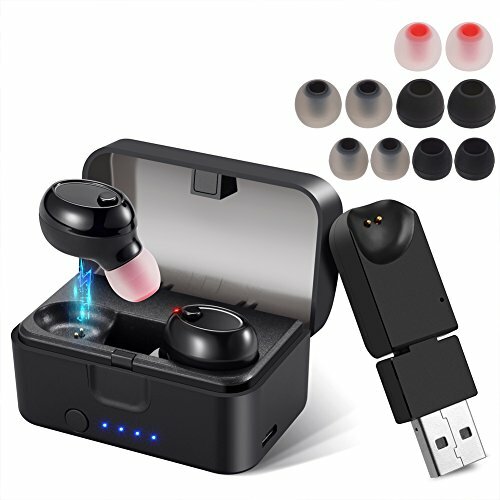 【Super Compatible Ability】- 2018 Newest Mini Truly Wireless Earbuds. Bluetooth 4.2 with advanced audio decode technology. 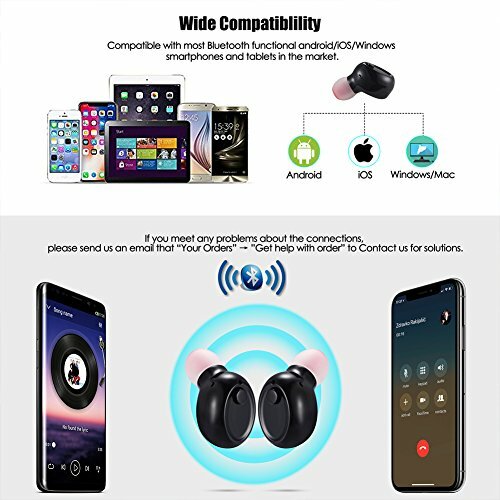 Compatible with most Bluetooth functional Android/iOS/Windows smartphones and tablets in the market. The Bluetooth transmission distance can reach 10 meters. 【Advanced Charging Box】- Compact 1000mAh Storage Box with charging function acts like a portable power bank which can support 6-7 times fully charging for the pair earbuds at any time anywhere. You never have to fiddle with cords, just put the earphones to the storage box and pick it up when you are ready to go. 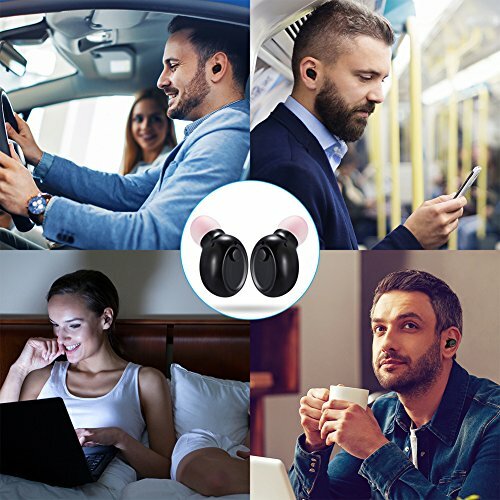 【Dual or Single Mode】- Each of the twin earbuds can be used separately or in pair. 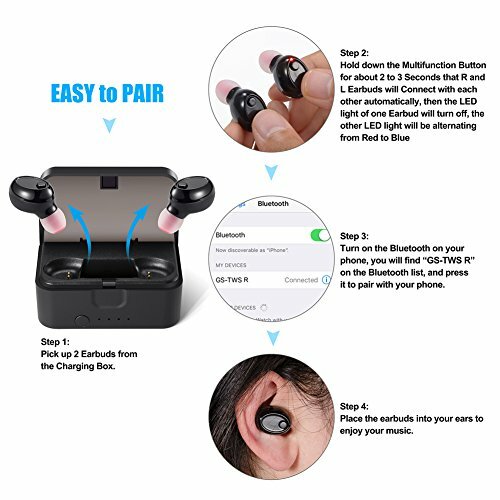 Connect two earbuds simultaneously that you can share music or video with your lover at the same time. Or you can choose the earbud L or earbud R for single channel mode. 【Longer Music and Talk Time】- Real stereo, left and right channel separation, HIFI sound and built-in noise cancellation technology. Built-in 60mAh Polymer Battery which will Make the Earbud last up to 5 hours of Continuous Talk Time or 3 hours for Premium Quality Music Time. Perfect for Sports, Jogging, Gym Exercise, Watching TV, or Sleep. Ideal for Car Calling, Friends Chatting and Working Use.